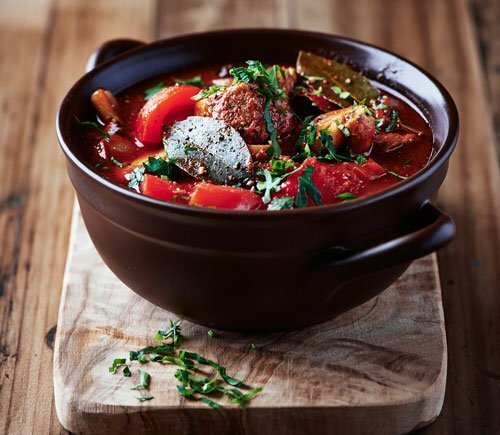 Did you know that the name of this dish originates from the Hungarian word, gulyas, which means herdsman? Hungarian Goulash is a hearty thick and flavourful stew. An excellent dinner choice for those blustery fall days to come. It’s so easy to prepare too, and can be frozen (leave out potatoes). It’s also even better tasting the next day. Don’t skimp on the paprika. It’s the national Hungarian spice! In a small bowl, combine flour, paprika, salt, pepper, and thyme; mix well. Add to meat mixture, tossing to coat well. Combine game meat or bison mixture, onion, and garlic; mix well. Add the meat mixture and quickly sauté . Add tomatoes with liquid, carrots, potatoes, celery, green pepper, parsley and bay leaf. Add water just until meat and vegetables are covered. If you feel you have added too much water, just simmer uncovered for a little longer so that excess water evaporates. Cover and cook on MEDIUM HIGH setting until boiling. Lower temperature to a simmer for 2-1/2 hours, or until game meat/bison is fork-tender. Remove and discard bay leaf. Stir in sour cream. During the last 10 minutes add some noodles or rice uncooked to the pot. If it’s too thick add a little water. Northfork Bison carries elk stewing meat, bison stewing meat and wild boar stewing meat. 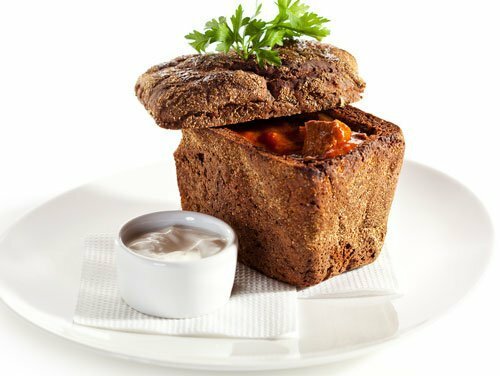 Take a crusty bread loaf, cut out the inside and ladle in the goulash. 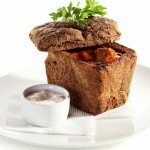 Top the soup with a dollop of sour cream, Serve with the chunks of bread saved from the inside of the crusty bread.